At the beginning of this year, our outlook for 2012 was built around the theme of investing in the face of a weak global economy. At the time economists had come to the realization that the U.S. economy was not just in a weak patch and that Europe's sovereign debt crisis was a long way from being resolved. The consensus was that real GDP growth would slow to a 2.2% rate in 2012 â€” forecasts that now appear to have been too rosy. Today the economists surveyed by Bloomberg expect the U.S. economy to eke out real output growth of only 1.9% for the second half of 2012 and to average less than 2.2% in the coming 12 months. They also expect Europe's recession â€” now three quarters old â€” to last until well into 2013, believe that Japan will experience several more quarters of below 2% growth, and recognize that growth is still slowing in the emerging markets. The weak growth is affecting the outlook for profits at U.S. corporations, which have been hitting record high levels. Since January of this year, however, analysts have been marking down their earnings estimates for the S&P 500, in large part because of signs of weakness in profits from overseas operations. Yet despite this less-than-cheery economic news, stock markets are up â€“ by a lot. Year-to-date the S&P 500 has risen 18% and despite Europe's woes, MSCI's EAFE index of foreign developed-country stocks is up by 15.9%. It is always possible to spin a story about stock prices finally responding to pent-up demand and investors growing weary of low interest rates on bank deposits and Treasury bonds. But anyone who has not been camping for a week in the Grand Canyon without electronics knows why global stock markets are up: They are responding enthusiastically to extraordinary easing actions by the European Central Bank (ECB), the Fed and, most recently, the Bank of Japan. Mario Draghi, head of the ECB, broke a log-jam during the past two weeks by first stating that the ECB would do "whatever it takes" to ease Europe's 34-month long debt crisis and then clarifying that by stating that it would be buying the sovereign bonds of Eurozone member states as long as the government under question is complying with a Eurozone-approved program. Bond yields for some of those countries, notably Spain, had crept above the 7% level that is widely considered unsustainable during the summer. The ECB's bond buying is intended to help member countries keep their borrowing costs down. The FOMC â€“ the policymaking body of the Federal Reserve â€“ followed last week by announcing it would buy $40 billion in U.S. agency-issued mortgage-related securities in an open-ended commitment that has been dubbed "QE3" as the third massive long-term securities buying or quantitative easing program initiated by the Fed since 2008. The Bank of Japan then announced it, too, would be providing massive monetary stimulus to its economy. Other central banks, including those in the emerging markets and the Bank of England are expected to follow suit, in part to try to keep their currencies competitive as monetary easing in the largest countries puts downward pressure on the major currencies. The provision of so much new stimulus by central banks is controversial. A majority (28 of 51) of economists surveyed by the Wall Street Journal the second week of September, for example, thought that another round of large-scale bond buying would be a mistake. The thinking, it appears, is that long-term interest rates are already so low that few private sector borrowing and investing decisions will be influenced by interest rates that are a few basis points lower. In addition, the concern is that flooding the markets with liquidity will risk higher future inflation and a plummeting dollar. Stock markets, however, are clearly not concerned. Global markets rallied on the announcements by both the ECB and the Fed, and indeed rose ahead of the announcement of the details of those central banks' programs. 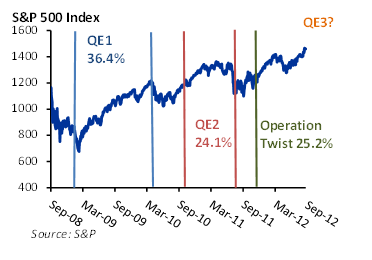 In this regard, the stock market's reaction is in line with its response to QE1, QE2, and "Operation Twist," a Fed program announced last September and still in place that seeks to reduce long-term interest rates by buying long-term Treasury securities and simultaneously selling an equivalent amount of short-term Treasuries: The market has risen following the initiation of all three of those programs (Exhibit 1). Despite the commitments of central banks to large-scale monetary stimulus, it is far from clear when the global economy will shake itself out of the doldrums. Historically, economies have taken years to emerge from the debt overhangs that have typically followed the bursting of bubbles and financial crises, and there is little reason to think that this time is different. And monetary stimulus works, in the words of the late Milton Friedman, with long and variable lags. To be sure, economic forecasters envisage a pickup in global growth beginning around the middle of next year, but economists nearly always forecast a return to trend in economic growth. A working assumption that global weakness will continue for several more quarters is on firmer ground, in our view. What is an investor to do when the outlook is for yet more weakness? Our recommendation a year ago, when the investment climate looked not much better than it does today, was to maintain a substantial allocation to equities, and to favor high-dividend paying stocks and defensive sectors within them. 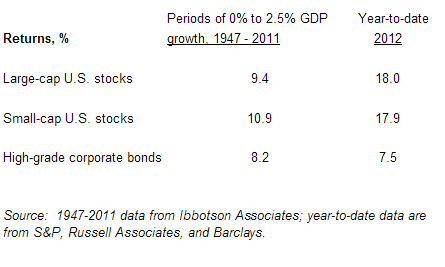 Within fixed income, meanwhile, we suggested investing in spread product, specifically high-grade corporate stocks. In addition, we recommended taking advantage of alternative strategies to help cushion volatility. These recommendations were based on historical relationships that showed that these kinds of assets did surprisingly well in periods of slow (0% to 2.5%) real GDP growth. Later in the year we amended these recommendations to include growth stocks, mostly based on our view that the outlook for technology and consumer discretionary stocks looked favorable. We also suggested that investors favor commodities as an asset class. So far this year, returns on at least three major asset classes â€” large and small-cap U.S. stocks and high-grade corporate bonds â€” have performed better or almost as well in this year's slow-growth environment than historical relationships would suggest (Exhibit 2). Commodities have not performed well as an asset class, however, mainly because of a more-rapid-than-expected deceleration in China's economy, which is the world's largest user of commodities. Looking ahead, the global economic outlook today is remarkably similar to what it was at the beginning of the year: Slow GDP growth and the potential for high market volatility. To be sure, the massive monetary stimulus being provided by central banks around the world will eventually reflate the global economy, but we lack conviction about when this will occur. So far this year, volatility has been subdued, which is remarkable in a world with so much potential for a surprisingly poor economic outcome in Europe, rising geopolitical risks in the Middle East (including Iran), and a presidential election in the United States. As of September 21 the VIX index of future stock market volatility implied by options prices, colloquially known as the "fear index" stands about 14, which is below its average of almost 23 since the beginning of 2007 and well below the 40-60 level it sometimes reaches during periods of financial and political stress. We believe, however, that the November 6 presidential election and the fiscal cliff approaching after the turn of the year have the potential to lead to a rise in volatility. Equities: Overweight large-cap relative to small- and mid-cap stocks. Favor domestic over foreign stocks, growth over value stocks, and maintain a bias toward fundamental- and dividend- focused fund managers. Fixed income: Overweight spread product vs. Treasuries, and bonds with lower duration vs. those with greater interest rate sensitivity. Alternatives: Stay diversified in this composite asset class whose managers have the latitude to respond to a variety of market conditions. Favor global macro absolute return and market neutral funds, commodities (which should benefit from a weaker dollar), and global real estate investment trusts. It is natural for investors to try to anticipate the results of presidential elections and position their portfolios accordingly. We are not convinced of the wisdom of doing this. While presidential election predictions have improved over time with more frequent and accurate polls, it is not clear that the same can be said about the ability to forecast the market's reaction to election results. This is in no small part because the market's response can vary with the joint outcomes of races for seats in and control of both houses of Congress as well as for the White House. Without committing to a forecast of the outcome of the November elections, it is possible to discern patterns in how the market has performed in past election years. According to Ned Davis Research, the Dow Jones Industrial Average has on average underperformed in January-October in presidential election years since 1900 relative to non-election years, but outperformed in November and December. This is consistent with a rise in the market as uncertainty is resolved by the election â€” one way or another. It is worth a word of caution, however, that this is a tendency only. Many other factors can affect the course of the stock market during an election year. Remember 2008, when the market tanked as the global financial crisis deepened at the end of the year? One such special factor this year could be the "fiscal cliff" â€” the tax hikes and automatic spending cuts that are scheduled to occur after the turn of the year absent action by Congress and the president. Uncertainty about how the issue will be resolved could easily cancel out any post-election market boost. Tax policy: A Republican victory is far more likely to result in an extension of the Bush-era tax cuts on households earning more than $250,000, which should favor providers of luxury goods, though the effect is unlikely to be large (wealthier consumers have a lower propensity to consume than the less wealthy). A Republican win would also likely encourage the repatriation of large cash holdings held overseas by technology firms. Regulation: Republicans are more likely to back away from corporate average fuel economy (CAFE) rules, to the benefit of the auto industry. The outlook for more flexibility in the enforcement of the Dodd-Frank bill following a Republican win will favor financial firms, both large and small. Democrats, meanwhile, would be more likely to continue or expand programs to deter foreclosures. The reduced supply of existing homes on the market would spur new home building and benefit homebuilders. Energy policy: If Democrats win, look for a renewed push on renewable energy, which should benefit producers of natural gas, lithium batteries, and hybrid vehicles. Manufacturers of materials that qualify for energy-efficient programs, and the firms that install them, should also benefit. A Republican victory should benefit the extractive industries generally, including drillers, oil service providers, diversified oil companies, coal producers, and mining companies. Healthcare: Insurers stand to benefit from the expansion of coverage and larger insurance pools, but will face higher costs because they will be required to spend a large portion of premiums on health-related costs. The drug industry and hospitals, hoping for new business, supported the legislation. Drug stores are likely to benefit from a Democratic victory in that more prescriptions are likely to be filled. One tip-off to potential winners and losers: When the Supreme Court affirmed many portions of the legislation on July 28, stock prices of major insurance companies fell, while those of hospitals rose. Technology: If Democrats win, large-cap broadband firms stand to gain from an expanded fiber build-up. A higher level of R&D spending under a Democratic administration would likely benefit providers of medical software.